You asked for it, so here it is! The original chunk hole fixing plugin is back! On teleportation, sometimes the chunk data gets "lost in transit". This plugin fills in the gaps automatically, so you won't even know it's running. Your server may not require it, or it may occasionally require it; but here it is should you wish to run it. 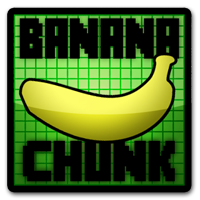 Should you get stuck in a chunk hole, the plugin also provides a /chunkme command to force-resend the chunk you are currently in. Wow, This plugin is great. I have been looking for a simple plugin to refresh chunks for years... and now I find this one. It still works on Spigot 1.7.10 and very efficiently. Thank you for developing this plugin. It took forever to find this plugin, but it looks like it's finally solved my teleporter woes, at least for now. Great work, and thanks! The most useful plugin ever!!! You can take spout which has this feature built in, but spout lags your server like craaaaaazy or crashes it! THIS PLUGIN IS BRILLIANT!!!! Pretty sure that's a craftbukkit bug. It just so happens that any plugin that refreshes the chunk on teleport hits this bug. I've found a bug regarding bananachunk, and its weirdness surrounding minecarts/entities. I originally had the issue where players couldn't exit minecarts, unless they pushed themselves into another chunk, then it'd allow them to exit. This began after MC 1.3 was released. I've noticed today that its not limited to minecarts but can also effect other interactions with entities, namely citizens NPCs. It basically makes the entitiy (npc or cart) un-hittable. I have no clue how bananachunk is at fault, but the problem goes away entirely when bananachunk is removed, can be reproduced with carts on a server with only bananachunk installed and no other plugins. If you could take some time out of your day to look into this I'd be very thankful, along with the others who enjoy this plugin. I'll be on #bananacode if you'd like to chat/test this with me. I'll add a cooldown for you. Sounds cool. But it seemed to cause weird issues when I used Spoutcraft. Chunks would sometimes not load instead. Does this plugin have a cool down timer so players can't constantly run the command, as it really should not be needed very frequently, and when needed, shouldn't be used excessively. I don't know about you guys, but for now I prefer an annoyance with minecarts than dieing on teleport. Heh. Sweet. I miss this plugin :) Thanks!